25'ft. Standard 8mm Daylight Spool. Note: the spool and film is 16mm. wide. 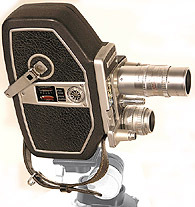 Standard 8mm film was supplied on 25'ft. daylight loading spools. The cine camera was loaded with the full spool of new unexposed film in subdued light. The film subject matter was then shot, using up the 25' ft. of film to the end. The full spool is now empty and the take-up spool is now full. Both spools were removed, the full spool flipped over, and reloaded for a second run through the camera to expose the other side again to the end. The twice exposed 25'ft. spool now has a full 50'ft. of exposed picture and is ready for despatch for processing. 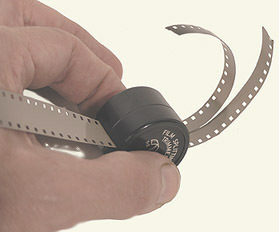 The same film that passed through the camera was sent off for processing at the film manufacturers' own laboratories. 'B' represents the first exposure of 25ft through the camera, while 'A' represents, (after turning over and reloading the camera spool), the second exposure along the 25'ft unexposed side. In the laboratory the processed 25'ft was then split lengthwise into two 8mm lengths making 50'ft total. These two lengths of film were then cement joined in the laboratory into one 50'ft. 8mm wide length with a short white leader at each end. The film was returned on a small 50'ft. plastic reel ready for projection. This original film was then returned after processing ready for projection. Small reels could be joined onto larger reels representing a holiday event. Films could have the addition of titles and sound. Note to the illustrations: The fully-processed film was split. The frames of picture ran along each side of the unsplit 25'ft length. www.Ian-Partridge.Com ~ Web page content photography and design ~ Copyright ©2009 2017 Ian Partridge.